Flexzion Trail and Game Hunting Camera is manufactured to help you preserve and capture your remarkable moments with its distinct features designed mainly to address the concerns of hunters and outdoor enthusiast like you. This game and trail hunting camera record images, either as still photograph or video and allows you to take footage with the burst rapid-fire continuous shooting that can take up to 9 photos in a single shot at a fast trigger speed time of 0.6-08 seconds. Users can do customization by reprogramming the time lapse and use the time switch instead for better coverage. Time-lapse can also take pictures at a preset interval from 1 second to 24 hours. It offers better quality images in a 12 megapixels high definition and lives colored image with up to 4 times digital zoom capability. Videos can be recorded with audio sound in high quality and full colored resolution at 720P to 1920×1080 HD. Also, it automatically set itself in low ambient light to night vision mode through motorized IR-Cut-Remove filter for clearer monochromatic images during nighttime. It has 36 times no glow black IR LED night vision to flash that is capable of covering more extended distance detection range up to 75 feet and takes vivid pictures or records video regardless of its light condition. The PIR motion sensor attached to the camera can be adjusted for extended use especially when monitoring a cold-blooded animal. It can capture continuously and simultaneously in a full HD resolution images and recorded videos on every trigger. It can withstand water exposure since it is waterproof and rugged to work even in the midst of a rough environment. Flexzion’s battery pack can also support solar panel connection for a more prolonged extension of its battery life. Extended Battery Life- It can accommodate solar panel energy to extend its battery life. Accessory- It comes with a durable strap made to hold and clasp the camera when hanged in a tree and a security lock is provided to discourage theft. Sensible- It automatically takes pictures when it senses motion. It can take vivid images even within the range of 75 feet. Also, it provides ID photo that imprints Exif data which includes the date, time, and other data points such as temperature and moon phase. 24/7 Duty- It can work both day and night and function at its best. It alters the color during nighttime to produce clear monochromatic themed pictures. It can also function as home surveillance camera all day and all night. Adjustable PIR- It has a motion detection sensor that can be adjusted and is useful for cold-blooded animal and surveillance security. Its special hybrid mode allows simultaneously capturing full resolution images and videos on every trigger simultaneously. Regardless of Light Condition- It can take high definition photos despite poor lighting. Can take vivid images even during nighttime in a black and white filter because of its built-in 36 pieces IR LED. Sensitivity- Sensors are too sensitive that it can detect even the lightest and it lacks focus when not appropriately positioned. Manual Fonts- The manual provided is not readable because of the font size and format. Compatibility- Since the SD card is not included in the purchase, you need to provide your own. Hence it does not recognize all types of memory cards. Motion Detection- It is controlled its sensory motion motors that can detect movements to take pictures and unfortunately it does not take pictures when there is no movement detected within its scope. 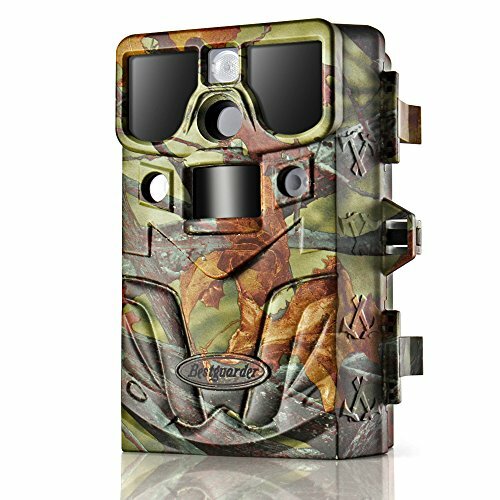 Flexzion Trail and Game Hunting Camera with the product dimension of 5.12 x 3.54 x 2.36 inch, has a wide LCD screen of 2.0′ TFT. It has the lens specs of F=2.4; FOV=60 degree; Max View 62 degree; Auto IR-Cut-Remove (at night). It has an angle of 65 degrees on its adjustable PIR and a 36 pieces 940 nanometer black IR-LED flash from 0.23m/75 feet that has the trigger speed of 0.6-0.8 second and a trigger interval of 1 second to 1 hour. It is able to zoom pictures up to 4x wide and caters pictures sizes of 12 MP =4000×3000 8MP=3840×2160 5MP=2944×1656 2MP=1920×1080 in a JPEG format and a video size of 1080P 1920×1080, 720P 1080×720, 24fps AVI. It can accommodate SD cards up to 32 GB which saves thousands of pictures in full quality. This device is protected with security password with a serial number that requires 8xAA ion-lithium batteries to operate. Who is the best customer for this product? This device is made for individuals who are looking for trail cameras that can work both in an easy and rough environment. It comes with an IR-LED flash that is suitable for people who are up to hunting during nighttime of early dawn. It can adjust the PIR to go along with the lighting condition producing a vivid and high-quality photo. Also, it is suitable for those who are looking for an economical home surveillance camera that can functional 24/7 with extended battery life. The ability of game cameras is that it can be of significant help to most of the hunters by identifying where are the game is located which makes it more useful for pre-season scouting. The information provided, when used in collaboration with the trail camera software and built-in programs will tell the hunters where to best place their trail blind or tree stand. With this, it makes hunting more efficient and effective. Flexzion Trail and Game Hunting Camera can help you with that and resolve the old and recurring issues having no sustainable camera that can withstand both water and rough conditions and produces high-quality pictures with IR-LED flash.